Find a Wine | About Viognier | Featured Wine | News | Trade | Register | Tell a Friend | Tell Us! Welcome to 'Enjoying Viognier', a unique website dedicated to just one grape variety and to all those who enjoy the wines produced from it. We want to increase your enjoyment by helping you to discover new and different Viogniers from around the world. 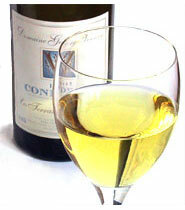 Viognier is fast growing in popularity - the choice of drinkers and growers alike. The last ten years has seen a massive increase in Viognier production throughout the world and more recently we have begun to see bottles on our supermarket shelves - challenging the monopoly of Chardonnay. Discover the wide range of clean tastes that stimulate the palate and make Viognier enjoyable with a wide variety of foods or just on its own. Discover something of the wine's unique story and what's happening to it now. Find new wines from different parts of the world by using our searchable catalogue that provides details of wines, producers, and retailers. Periodically we feature a wine. These wines are usually readily available and range from cheap Chilean Viogniers through to pricey Condrieu. If you would like to contribute to the site in this or any other way, please contact us. 19 Oct 2003 - 400 Viogniers!